September is IoUC’s Robot Month. Our book club selections reflect the theme. Do you have some suggestions for this topic? In a world of self-driving cars and big data, smart algorithms and Siri, we know that artificial intelligence is getting smarter every day. Though all these nifty devices and programs might make our lives easier, they’re also well on their way to making “good” jobs obsolete. A computer winning Jeopardy might seem like a trivial, if impressive, feat, but the same technology is making paralegals redundant as it undertakes electronic discovery, and is soon to do the same for radiologists. And that, no doubt, will only be the beginning. In Silicon Valley the phrase “disruptive technology” is tossed around on a casual basis. No one doubts that technology has the power to devastate entire industries and upend various sectors of the job market. 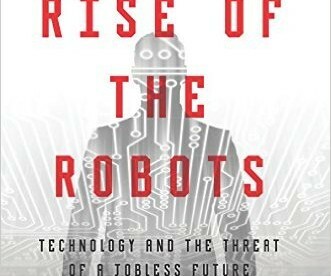 But Rise of the Robots asks a bigger question: can accelerating technology disrupt our entire economic system to the point where a fundamental restructuring is required? Companies like Facebook and YouTube may only need a handful of employees to achieve enormous valuations, but what will be the fate of those of us not lucky or smart enough to have gotten into the great shift from human labor to computation? The more Pollyannaish, or just simply uninformed, might imagine that this industrial revolution will unfold like the last: even as some jobs are eliminated, more will be created to deal with the new devices of a new era. 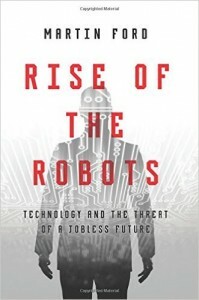 In Rise of the Robots, Martin Ford argues that is absolutely not the case. Increasingly, machines will be able to take care of themselves, and fewer jobs will be necessary. The effects of this transition could be shattering. Unless we begin to radically reassess the fundamentals of how our economy works, we could have both an enormous population of the unemployed-the truck drivers, warehouse workers, cooks, lawyers, doctors, teachers, programmers, and many, many more, whose labors have been rendered superfluous by automated and intelligent machines-and a general economy that, bereft of consumers, implodes under the weight of its own contradictions. We are at an inflection point-do we continue to listen to those who argue that nothing fundamental has changed, and take a bad bet on a miserable future, or do we begin to discuss what we must do to ensure all of us, and not just the few, benefit from the awesome power of artificial intelligence? The time to choose is now. Rise of the Robots is a both an exploration of this new technology and a call to arms to address its implications. 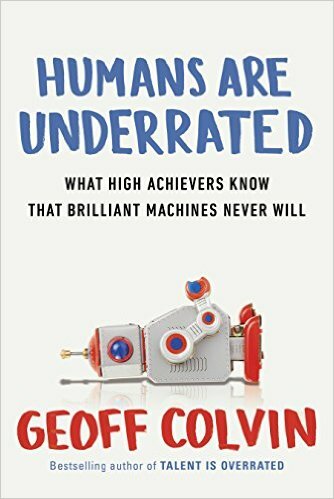 Written by a successful Silicon Valley entrepreneur, this is an audiobook that cannot be dismissed as the ranting of a Luddite or an outsider. Ford has seen the future, and he knows that for some of us, the rise of the robots will be very frightening indeed. It’s easy to imagine a nightmare scenario in which computers simply take over most of the tasks that people now get paid to do. While we’ll still need high-level decision makers and computer developers, those tasks won’t keep most working-age people employed or allow their living standard to rise. The unavoidable question—will millions of people lose out, unable to best the machine?—is increasingly dominating business, education, economics, and policy. 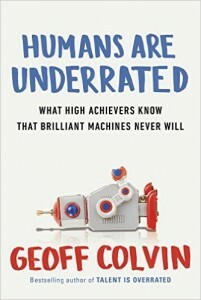 The bestselling author of Talent Is Overrated explains how the skills the economy values are changing in historic ways. The abilities that will prove most essential to our success are no longer the technical, classroom-taught left-brain skills that economic advances have demanded from workers in the past. Instead, our greatest advantage lies in what we humans are most powerfully driven to do for and with one another, arising from our deepest, most essentially human abilities—empathy, creativity, social sensitivity, storytelling, humor, building relationships, and expressing ourselves with greater power than logic can ever achieve. This is how we create durable value that is not easily replicated by technology—because we’re hardwired to want it from humans. • Stanford Business School, which has overhauled its curriculum to teach interpersonal skills through human-to-human experiences. As technology advances, we shouldn’t focus on beating computers at what they do—we’ll lose that contest. Instead, we must develop our most essential human abilities and teach our kids to value not just technology but also the richness of interpersonal experience. They will be the most valuable people in our world because of it. Colvin proves that to a far greater degree than most of us ever imagined, we already have what it takes to be great.